Land of the Lustrous has immediately managed to captivate its audience with its very particular atmosphere and striking visuals. And it’s achieved that not in spite of its almost fully CGi production, but rather because of it, for the most part. This interview, originally published online in animate Times, sits down with director Takahiko Kyougoku, to talk about his approach to such a unique setting, the fascinating ambiguity of the manga and how he translated it into anime form, as well as the production process at studio Orange. — Could you tell us how you came to direct Land of the Lustrous? How did you feel when the decision was made? I believe it was two years ago, around the time I was working on GATE, that I was approached by (Katsuhiro) Takei from TOHO. Upon reading the original manga, I was left with the impression that it would be difficult to surpass it by just copying what was on the page panel by panel, and that if we were to animate it, it should be done in CG. I replied as such, but it seems as though that had been Takei-san’s intentions all along. I felt that it would provide new challenges on a technical level as well, so I think it was also a match for the work’s style in that sense. Instead of having traditional animation as the base and trying to capture that feel with CG, I had always wanted to try starting with CG and making the 2D animation approach the CG. I thought it’d be a good fit for Land of the Lustrous. I think this is what led to the show’s distinctive look and feel. — What were your thoughts and impressions when you read the original work? When I first read it, I was really just blown away. I think the appeal of the series is the ambiguity of it all — how it defies description. It doesn’t explicitly tell you about the identity of the villains or what their motivations are, and then you have this setting you’d never think of in a million years, populated by 300-year-old gemstones. That may be the appeal of (Haruko) Ichikawa-san’s work, but at the same time I realized how difficult it would be to convey this in animation with a single airing run. A manga can be read over and over, so there’s room to depict things more subtly. But an anime needs to relay who the protagonist is and what drives them at first glance to whoever may watch it, so there are parts in the first episode where we had to be creative with the direction. To go into more detail, we took steps like giving the main character more close-up shots, or having them intentionally repeat important lines. It may not seem like much, but when you watch it, you can tell which character had the most presence and what their goals are. The text of the material is left the same, but we can control what impressions are left upon the viewers with the use of recognizable iconography and clear direction. — What kind of discussions did you have with the original author, Haruko Ichikawa? I had the chance to meet her for the first time when I visited Kodansha, and although we were similar in age, I was worried about whether she would be hard to deal with. But once I spoke with her, we ended up having a spirited conversation where we shared our thoughts. Ichikawa-sensei herself is charming in a mysterious way — almost philosophical — that I think you can see in her work. — Is there anything new you learned about the characters, the worldview, or the setting of the story from speaking with her? I found out what happens later in the story. Well, I can’t exactly talk about that here (laughs). We talked about a lot of things, though much of that won’t be able to make it to the anime can’t show as we need to keep in line with the progress of the manga. One fact I learned that I found surprising was that the gems are actually wearing mourning clothes. It’s supposed to show how they treat life and death, which makes sense. There’s one thing that the anime must do. 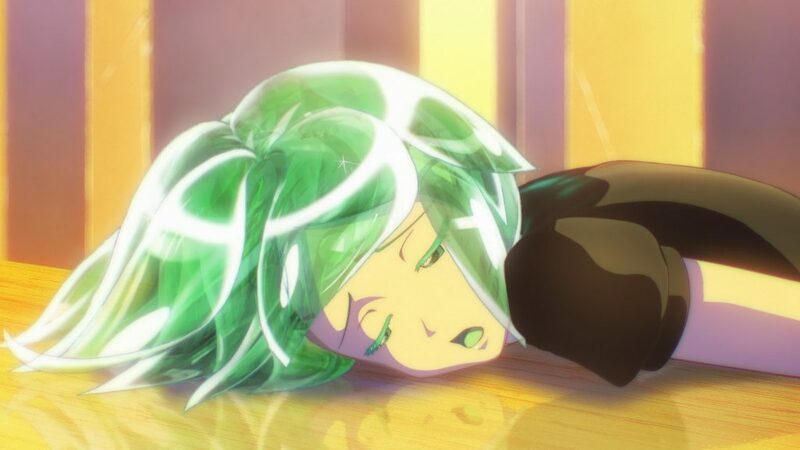 The way that it portrays how Phos changes throughout, leaving it uncertain as to whether that change is positive or negative, is what makes the show special. In addition, it’s Phos’s meeting with Cinnabar that triggers this change. These two things are the foundations of the work. I spoke with Ichikawa-sensei at story development meetings about how it might be best if the anime strikes the right balance, so as to avoid overly concerning the viewer about questions like “What exactly are the Lunarians?” If we were to explore them in detail, we wouldn’t be able to fit it all in 12 episodes. I was asked by Ichikawa-sensei to refrain from touching on elements that haven’t appeared in the manga yet, so I feel that my job is to organize what already exists in the original for the anime adaptation. — How did you envision the show to look as a CG production? The appeal of the series is how beautiful the gemstones are, but gems are difficult to depict with hand-drawn animation, where you have to illustrate their translucency through color. CG’s main strength here is that you can portray gems just as they are. Land of the Lustrous‘s appeal lies in being able to visually awe the audience, and this does so in a way that only the anime can. This isn’t a show that plays for laughs, but there are comedic segments that we don’t want to just ignore. So our goal was to do well in that aspect as well. As such, we needed a lot of facial expressions. We took great care to include some very exaggerated faces that you would not normally see in an anime series. — What would you say is special about the staff composition? Takei-san had said from the beginning that he wanted (the production studio) to be Orange, so we started with that assumption. I knew they were talented, but I had no idea there would be so many people, so early on I was a bit worried about having them fully produce it. At first, they had less than 50 people, but the number of workers has increased to about 100 people at present. It’s been quite the dramatic change. I had Toshiya Oono, who did the series composition, break down the difficult parts of the scenario scene by scene. I’ve often worked in the past with the character designer, Asako Nishida, and she had told me she was a fan of the manga, so I gladly entrusted her with the job. I had Nishida-san create all of the references for the proportions and faces for the anime. I got back a wide range of expressions even though I hadn’t given detailed instructions, which saved me a lot of trouble. — Having watched episode 1, I was pleasantly surprised at how much action there was. Orange’s crew has always been good at action, having worked on Rebuild of Evangelion and so on, so I knew they would be able to pull it off. My instructions didn’t amount to much. It was along the lines of, “Have the camera come in from the right and move to the other side, and cut it there.” Of course, that was written in the storyboard as well. And before I knew it, the camera would be spinning all over the place, as they’re known to do. But if you focus too much on that kind of stuff, you end up losing sight of what you wanted to accomplish in the story itself… It’s not enough to just show them fighting. You need to clearly show why someone acts the way they do, and firmly establish things on a dramatic level before going wild creatively. It’s like how you need to have a setter in volleyball. Orange is a unique studio, so the real question is how to best make use of its talents. — How was the CG workflow? There is no keyframe animation as the basis like you often see in anime, so we went straight from animatics (video storyboards) to 3D. — Were there any parts of the production process where you had trouble? This is the first time that Orange has created an anime as the main production studio, so a lot of time was spent adjusting to this different situation from the CG productions they were used to. If we tried to craft Pixar-level 3D, a single cut would take several days and we would never make it in time for broadcast. On the other hand, the more you try and cut corners, the more it becomes meaningless to do it in CG, so we needed to work while walking that fine line. And it’s not as though we didn’t know what to do; from the beginning, I made it known that I envisioned the gems as figures with clear parts, but moving. So it was really about how to bring that to life. In terms of character modeling, it was a question of how the faces and hair looked and felt. Ichikawa-san had told me all of the gems have basically the same bodily proportions, and that we should refrain from making them look different. This makes things very easy in CG, so we could focus on the direction from the neck up. They’re designed so that we can hand-animate them from the neck down with no problems. Thanks to Orange’s technical prowess, it didn’t really feel like I myself had much trouble; but since we had to do everything here, the process was a slow and gradual one, like that of diligently weaving a bolt of cloth. The very first storyboard is from June of last year, so it’s substantially more time-consuming than regular animation. The show is like a cicada that’s buried itself in the dirt for 18 months, to only now come peeking out (laughs). In return, I’m very happy with how it came out. — We have the protagonist, Phosphophyllite, one of the 28 gems. Could you talk about your impressions of them and what you focused on when establishing their character? I struggled for quite a bit at the beginning. I’m used to working with characters in their teens, who have obvious desires and acting on simple motives. As for Phos, they’ve spent 300 years not doing anything, so even their frustration lacks resolve and has an air of resignation to it, or so I was told by Ichikawa-san. A human who’s lived for 300 years would be positively geriatric (laughs). The large gap between their appearance and mental maturity is what defines them, but there’s no one like that on Earth, so I felt it might be hard to empathize with such a character. But if we could pull it off, we’d end up with something quite unique, so I made sure to focus on that aspect. To be more specific, Phos has a wide range of emotions and you see them angry or sulking, but they’re never terribly serious about it. Even when they ask Master Kongou to be placed in battle, they’re surprisingly lax about it. In creating them, I’ve put forward all I can before pulling away, so it’s less that I’ve put myself into Phos, and more like I’m standing far away from them. I think this shows in the anime, but even now, it’s hard to try and put it into words (laughs). — How did you feel about the cast members for the series? Well in short, they’re all very talented people, which I was thankful for, to the point of feeling that I didn’t deserve such a luxurious cast. The main character Phos feels appropriately spontaneous, and everyone in the supporting cast worked to preserve that mood. They gave wholly impeccable performances, so I have no complaints on the acting side. — Tomoyo Kurosawa plays Phos. What did you think of her performance? Kurosawa-san, who is the voice of Phos, gives off the sense that she was born to play the role. When we had auditions, she was the only one physically acting out the lines without looking at the script. It’s like she had become Phos right then and there. That may have just been her way of trying to sell it, but it really felt like she had embraced the character, and I’m glad we were able to have her for the anime. My mental picture of Phos formed itself upon hearing Kurosawa-san’s performance. Usually, the voices are recorded after the animation process, but for Land of the Lustrous, we create animatics, record the voices, and then turn it into CG. Kurosawa-san’s acting has that perfect level of ambiguity to it, where she’s supposed to be angry but ends up sounding deflated, and we were able to learn from that natural, effortless aspect of her portrayal. — All 28 gems have their own individual charms, but their leader, Master Kongou, has an overwhelming sense of presence. I’ve worked with Jouji Nakata since Sgt. Frog, and I love him as an actor, so I’m glad he agreed to play this role. Nakata-san himself is quite gentlemanly, so he was a perfect fit for Master Kongou. If he had sounded too sultry and charming, it wouldn’t feel like Master Kongou, so I think he plays the part with just the right balance. — Which character would you name if you had to choose a favorite? I don’t like anyone in particular over another, but think of all of them equally, like a teacher would their students. In terms of having a striking silhouette, maybe Morganite? Their bunched hair is quite prominent, and there’s a lot of touches in their design that only work animated, so I think they really stand out. 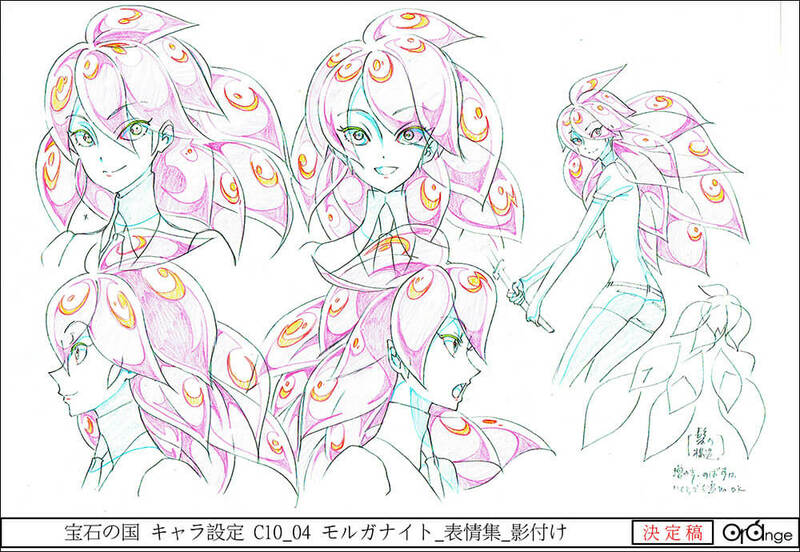 Asako Nishida’s design sheet for Morganite. Also, Cinnabar gave us a lot of trouble when we animated them. Cinnabar’s hair is finely detailed and they are constantly surrounded by mercury, not to mention their subtle acting. It’s hard to show things like their eyes slightly narrowing, but in turn, I think they end up being a character that really shines. — The first episode aired a while back. What did you think when you saw the completed footage? I think it ended up looking really gorgeous. It’s not often that you’re able to deliver a finished episode without lingering regrets due to time constraints, but as of now, with episode 4 complete, I’m pleased to say I’ve had no such regrets so far. — It seems like there’s been a notable response ahead of the broadcast, from those who have seen the PV or the advance screening of episode 1. I could tell everyone was really looking forward to it, and I was especially encouraged by how the fans of the original responded positively to some of the visual liberties we had taken. — What would you say the most memorable scene from episode 1 is? 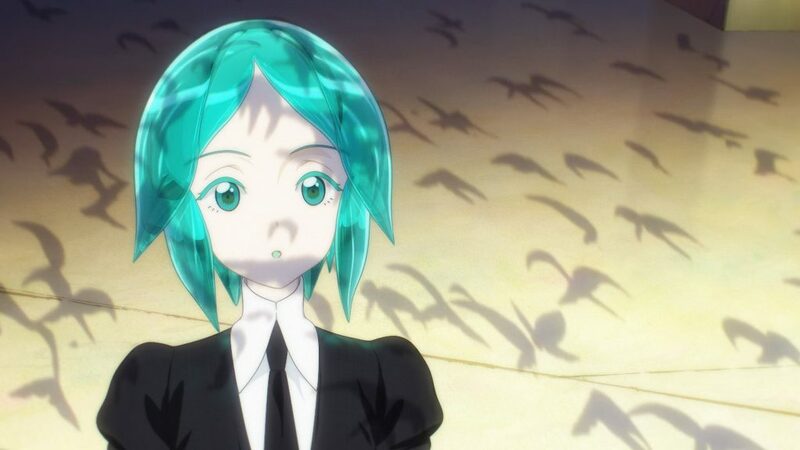 I would say the scene at the beginning where you see the swaying grass, and then Phos’s head, crystalline hair and all, pops onto screen. We had someone who used to work at Studio Ghibli [Yohichi Nishikawa] do the hand-drawn concept art. One of the pieces he made has the main character looking cel-shaded with the exception of their photorealistic head, and in front of them, some CG grass that looked like it came out of a photograph — a jumble of stock materials. But when all of the parts look so different, it paradoxically creates a sense of cohesion, and I felt we could create something that feels like nothing that’s come before it. It’s left a mark on me as a piece that shows everything I want to accomplish with this series. But I was met with doubt from those at the studio as to whether it could work. Having the first thing that we’d unveil to the world be so striking, to put it in a good way, or less kindly, an eyesore… It made us fear that we could just end up alienating the viewers. But luckily, once we saw how beautifully it came out, the mood changed to one of, “Hey, this could work!” The first few cuts took many months to draw, but it feels like once those were finished, the rest of it began to go smoothly. — Is there a scene or event you want to see animated in the future? Actually, it looks like we’ll be able to adapt all of the parts I had wanted to cover, so although the show is still in production, I’m really excited. My goal is to make a show that will make the audience go, “This isn’t just your run-of-the-mill anime,” so I hope I achieve this all the way to the finish line without losing steam. — Please tell us what we have to look forward to or should watch out for in upcoming episodes. I think viewers will be easily attracted by how beautiful the gems are. But from Ichikawa-sensei’s unique take on life and death, to this world where the lines between good and evil or friend and foe are blurred, there is a charm that exists in this series that’s hard to put into words, so I want the viewers to get a sense of that throughout these 12 episodes. Of course, there are multiple ways to enjoy Land of the Lustrous, but in the end I hope you will find it interesting on a conceptual level. We are continuing to improve on a technical level as well, so I hope you look forward to and pay attention to that too. 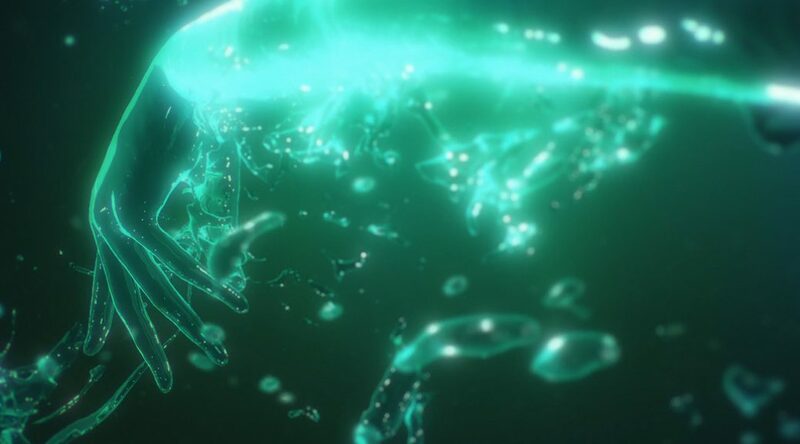 For an upcoming scene with waves, we’ve done everything from playing with real water to running simulations, and have put lots of care into it in general. 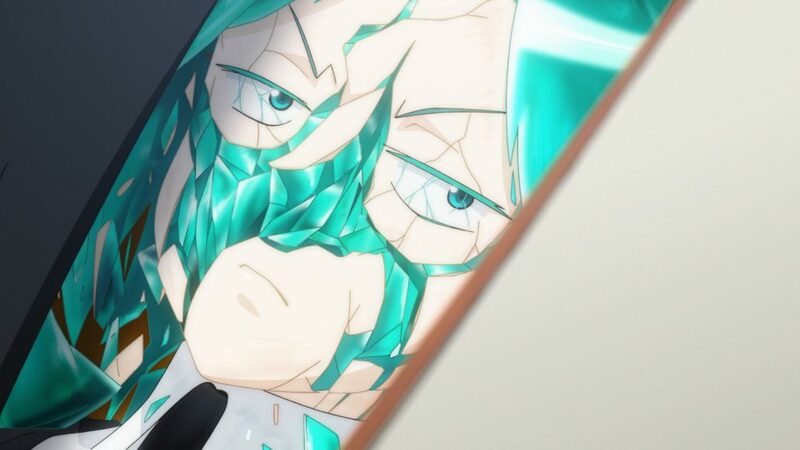 The way we visually represent Phos’s changes are incredible as well. There are scenes in the manga that you might wonder, “Just how are they going to adapt this in the anime?” The results are quite striking, with plenty of highlights, so please be on the lookout for those. — Finally, do you have a message for those reading this interview? For fans of the manga, I think we’ve managed to create an anime adaptation with its own distinct charms, and for those unfamiliar with Land of the Lustrous, I think it’ll be a series unlike any you’ve seen before. I’ve talked about a lot today, but I tried to make a show that you can have fun with at a simpler level as well. Nothing would make me happier than if you just tried out the show casually and ended up enjoying it. Again, interview originally published in Animate Times, who do some excellent anime journalism work that often goes unnoticed. Interesting to read that they are recording voices prior and then animating rather than following the typical production process. Perhaps having that voice to go off already plays a part role in the expressions often working so well in this as compared to many other CG productions coming out of Japan. The manga has this very special emotional sterility (which is intentional! They’re sentient rocks! ), so I’m not surprised that Kyougoku based Phos’ more articulate personality in the anime off Kurosawa’s excellent voice acting. I think there’s more to the show’s expression to that (like the exaggerated faces the talked about, which are often straight up hand drawn), but it’s definitely a factor that makes it much more humane than standard CG anime. The movement isn’t really there yet and neither are the minute gestures, but it’s a big improvement. attemptiion on using MoCap in anime CG (aside from dances) is there(polygon Also did it partially with Ajin), but the main problem is capturing natrual movment will not going well with limited-animation approach that intentionally droping down FPS.